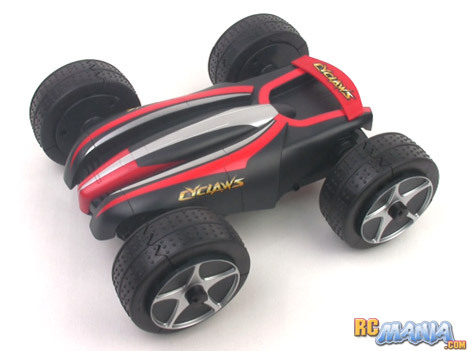 The Bandai Cyclaws was one of the last major toy RC releases of 2010. The premise is that it's a low-slung, sleek, fast racer with a surprise, hidden trick for overcoming big obstacles. In the center of each wheel is an innocuous black button. When you push one of these buttons, it locks or unlocks the "claw" action of that tire. Unlocked, the tire will split into three claws with terrain-gripping serrated ends. The tires themselves are soft rubber, too, so the traction potential is huge. If that wasn't interesting enough, the whole vehicle is designed to be equally driveable whether it's right side up, or up side down. I'm happy to report that the Bandai Cyclaws comes with everything you need to drive it. It has a 9.6V rechargable NiMH battery pack and a wall charger, and it even includes a 9V alkaline battery for the controller. After a 4-hour charge (which is shorter than the industry standard), it's time to try the Cyclaws out. I started my test with Cyclaws in normal car mode, with the tires locked together. The vehicle has a lot of power and will accelerate to full speed almost instantly. It uses skid steering, like a tank, so it can turn on a dime or do almost infinite donuts. It's not very fast, but it's extremely agile and the quick starts & stops make it exciting and challenging to drive. It doesn't have digital proportional controls, so you're either going full speed or not at all. Next I hit the wheel lock buttons and unleashed the claws. The "centrigugal force" effect causes the claws to open whenever the wheels are turning, but they don't stay open all the time. You're supposed to be able to open them by hand, but mine wouldn't stick in that position no matter what I did. The length of the expanded claws lift the whole Cyclaws vehicle off the ground and it looks mean & mad when it's driving like this, grabbing & slapping the ground. The transformation lets it go over dirt and moderately rough terrain that it could never overcome with normal-sized tires. Strangely the claws don't all open to the same amount at the same time when you're driving normally. If you hold the vehicle in the air and run it, everything looks good. On the ground, one or another tire may stay partially contracted or open & close randomly. This made the Cyclaws bounce around a bit from corner to corner as different claws opened & closed, but it didn't seem to negatively effect the terrain-handling abilities. The only bad thing that I experienced with the Cyclaws was getting twigs & other plant materials stuck in the claws and twisted around the axles. You'll want to keep an eye out for this, and clear off any debris that accumulates to avoid over-stressing the motors. The Bandai Cyclaws isn't the first vehicle that grows "claws" out of its wheels, but it may be the best so far. In a nutshell, it works as advertised. The original price of $79.99 US seemed a bit steep to me, but as of fall 2011 it was at Costco for under $30, which is a phenomenal deal. With all batteries included, it's a good value. Just be sure to only run it outside -- it's too much of a beast to use around the house!